First I want to thank the reader who pointed out the very best reason to click my Mixbook link in the right column and use them to publish your books...I can't believe I hadn't figured it out yet!!! The fact that they allow us to upload .png files and to spread across two pages means ... that all of us who do 2-page layouts can upload a single .PNG of our 2-page layouts so we don't loose quality and then spread it over two pages! No more guessing at allowances and cutting our layouts in two to upload!!!! I'm soooo excited! I already loved them, but hadn't realized this aspect yet! Click here to read all the other reasons I love them and have become an affiliate as a service to you. And if you click my link to them and actually purchase a book, I will receive a small commission that will go to help support the work of this blog. I wish I'd found them before all the money I've spent at three other publishers only to continually return them for redos. Today I'm sharing something extremely personal with you. I don't normally do this, but I need to remember this very much right now and I'm sure there are others out there who would be blessed reading this. For some of us, winter is dragging on and on with it's trials and dreariness. For others of us, the seasons don't greatly change our personal hell's (health issues of suffering, pain and loss of ability; difficult relationships in our homes or work; basic needs unmet) as we must walk through them every conscious moment without respite. For others, grief and loss have pierced our lives and challenge us to not succumb and be swallowed entirely by the emotional pain. The current economic problems in our country plague many of us and inject fear and unmet needs into into our daily lives. Often this has been true for many years. I know many of you out there must live with all of these as I do. It's difficult, to say the least, and depression hungrily lurks in the shadows and snaps at our heels because of our helplessness to change things. All these things make satan's work in our Christian lives very visible, complete with power and great suffering. He tells us to focus on Him and all the things He lists above. Don't let yourself focus on your situation, but on the solution, Him. Much easier said than done. My situation, like everyone who walks these dark paths, has slightly easier, better times, and other times that are barely survivable and leave you changed. Part of their poison is that many of the issues look to be permanent when they occur, but praise God, some turn out to be just for a season and then lessen or leave entirely. At one such time a couple of years ago, I was left with nothing at all health-wise. There was no longer any position that brought a bit of relief for even a moment. I could not hear, see, use my arms, swallow, the list goes on. Due to having no health care and no money, I could do nothing at all except sit in a recliner in my freezing home and suffer without respite in sight, believing it was forever. The Holy Spirit brought this verse to my mind and I made it my mental project. I sat there wrapped in many layers of clothes including my hat and outerwear and tried to think of every single happy moment I'd had in my life. I struggled to come up with them as they are well hidden when life is like this. I brought each to mind and then purposefully relived it in my mind in detail. Then I found another one. laying on my tummy as a small child, looking through the grass at ground level one day and seeing the tiniest lime green baby grasshopper - sheer magic! I remembered the moment I discovered that though I had thought that I was saved eternally because I had repented of my sins, that was not in keeping with what God has told us in His Holy Word; I remembered that entire night at 10:30 pm January 31st in 1978 when I repented afresh for my entire life, asked sweet Jesus to be my Savior, committing the entire rest of my life to God and to live in obedience to Him, serving Him, submitting to Him in all things, and then that most precious scene when I was immersed in water baptism in the name of the Father, the Son and the Holy Spirit, burying my old man of sin and rising to new life, a new creation in Christ, washed free from all my sins and with my name written in the Book of Life in heaven! I saw the faces of my beloved parents now long gone, my brother and sister all who had gotten out of bed on that freezing Chicago night and come to share that moment with me even though none of them understood it at that time. All but my dear Father followed me on this path before time ran out. I remember returning home to my tiny apartment in a housing project and washing my face for bed, floating on a heavenly high far beyond any drug, alcohol or other thrills that I'd tried. I caught a glimpse of myself in the little mirror over the sink and it struck me all the way through that I was pure and clean of all sin in God's eyes for the first time since I was old enough to sin. Pure! Me who had lived such an evil life! I was for that moment pure and spotless before the Holy God of all creation, by His grace! I just stared for the longest time, enraptured in the realization and wanting the moment to last forever. What a wonderful night that was! I know that the Bible tells us that after giving our lives to Him, that when we sin and we repent with our whole hearts, determining not to do it again, He forgives us fully with the example of removing it as far as the east is from the west, but it's not quite the same as that night's revelation. Utterly awesome! At EVERY SINGLE MOMENT of EVERY DAY, no matter what my personal existence is like, SOMEONE SOMEWHERE IN THIS WORLD is experiencing those same wonderful moments! Those good things still exist! They are still happening! Someone is falling in love right now! Someone is cradling their newborn child in their arms for the first time! Someone is discovering sparkling lightning bugs in the dark night and the magical tiny baby grasshopper in the giant world of grass! Somewhere a child is catching snowflakes on their tongue and baby giggles fill the air! Someone is changing their eternal destiny by repenting and giving their lives to God Almighty through His only begotten Son Jesus Christ! When it was over, I was so entirely refreshed in my spirit that I truly FELT like every one of those good things had just happened to me again! Tears well up in my eyes remembering how my spirit soared and how my burden lifted because of this most amazing vacation anyone ever had - all without moving a muscle or being able to do anything except choose my thoughts as my beloved Savior told me! When we are so deep in suffering, it truly seems all light and joy no longer exist anywhere, there is only blackest suffering and doom. It is a cherished revelation He gave me that good things not only still exist, but are happening every moment to someone somewhere! What a blessing! "For the Lamb at the center of the throne will be their shepherd; He will lead them to springs of living water. And God will wipe away every tear from their eyes." "He will wipe every tear from their eyes. There will be no more death or mourning or crying or pain, for the old order of things has passed away." Today's message is so important that I wanted to give you something big so more people would come and read, also to celebrate our Baby Boo being with us a full year now! See her sleeping on her cozy bed? That's about 12" from me here! Thank you Lord for the immense blessing and joy of Boo! 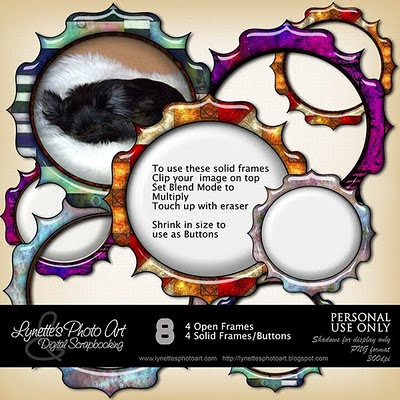 So here you can grab the entire set of these rich Glossy Frames (4 open frames and 4 solid frames), but only for today, then they will be in my store, so grab em quick and enjoy! Thanks for your very inspirational message today. I have been struggling with the recent suicide of a much loved nephew and your words touched me deeply. Thank you too for the frames. They are beautiful. That was a very powerful message today, thank you. You're in my prayers. Blessings always! Thank you so much Lynette for today's words. You are such a wonderful friend and I truly appreciate your messages. Hugs. Thank you for your lovely frames and even more for your inspirational tribute to God. Sometimes it is hard to remember that He never promised that life would be easy & peaceful but that he would be with use and would answer our prayers - even if the answer is "no" or "not right now". We would like for him to wave his magic wand and make it all better right now. He moves in his own way and time. God bless you in your life as you give hope to others.